Forain was born on the 23rd of October 1852 in the French city of Reims. His father painted ornamental signs and had a modest income. Forain soon displayed a strong passion for drawing: “the sculptures of Reims Cathedral were the origins of my vocation”.Around 1860, his family moved to Paris and, at the age of fourteen, the young Jean-Louis began to draw at the Louvre where he copied the masters. There, he met the painter Jacquesson de la Chevreuse who gave him drawing lessons. After he briefly assisted a class given by Jean-Léon Gérôme at the École des Beaux-Arts, his talent was noticed by the sculptor Jean-Baptiste Carpeaux who appointed him as one of his assistants for over a year. At 17, Forain led a bohemian life and, during the 1870 Franco-Prussian War, he took part in the defence of the fort of Montrouge near Paris. With his anarchist soul, he sympathised with the Communards who took control of the government in the aftermath of France’s defeat. His fun-loving personality led him to clubs and gatherings where he met and became close friends with Arthur Rimbaud and Paul Verlaine. Forain was nicknamed “Gavroche” by poets because of his dry humour and cheeky personality that hailed from Montmartre. For three months, Forain shared a squalid room with Rimbaud. In 1874, his first submission to the official Salon was rejected. That same year, he enrolled at the 101st Infantry Regiment of Laval. By 1875, he had returned to carrying out his bohemian life in the quartier latin and Montmartre. He was very poor, earning a meagre source of income by publishing some of his cartoons in small satirical newspapers such as Le Scapin in 1876, then La Cravache parisienne, La République des lettres, La Vie Moderne and Le Monde Parisien. 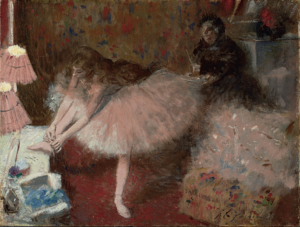 Degas introduced Forain to the world of opera which became one of his favourite topics, with its dancers and abonné, well-heeled French men who paid a subscription to be allowed behind the scenes. 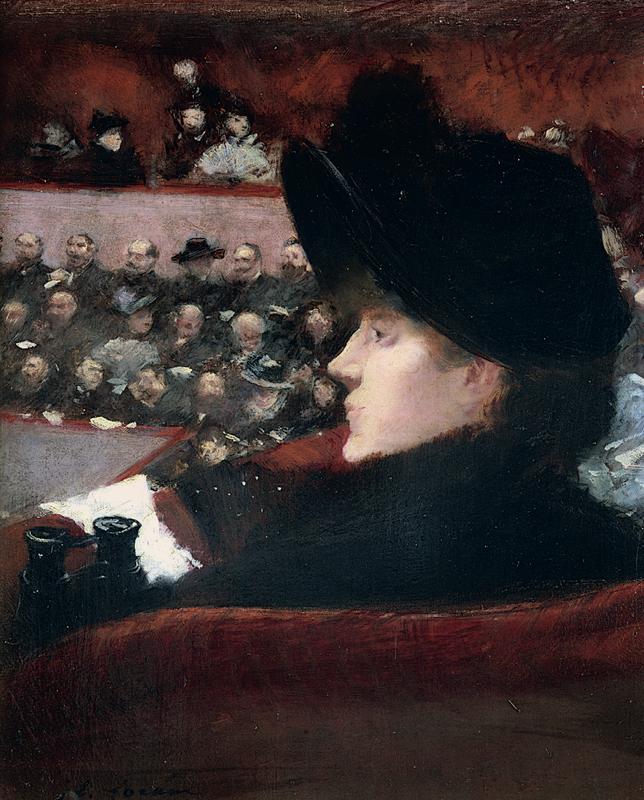 From 1879 to 1886, Degas invited him to participate in four out of the eight Impressionist Exhibitions taking place at the time. Observers noted the vigour and swiftness of his execution, the vivid colours and the satirical spirit characteristic of his work. 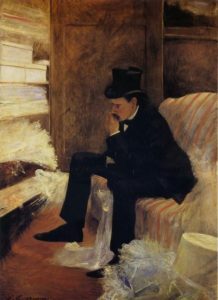 As a painter of modern life, it is often said that Forain was the youngest of the Impressionists and the most famous caricaturist of the Belle Époque. 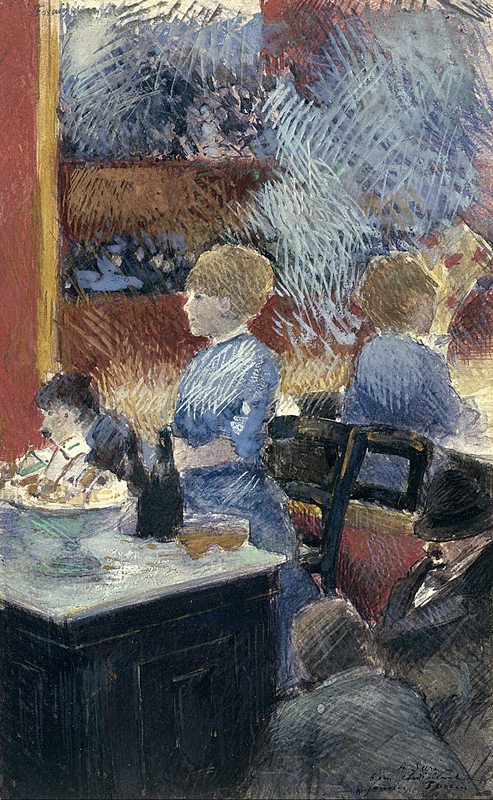 In 1884, one of his paintings, Le Buffet, was finally accepted into the official Salon. The following year, Le Veuf also successfully made the selection. 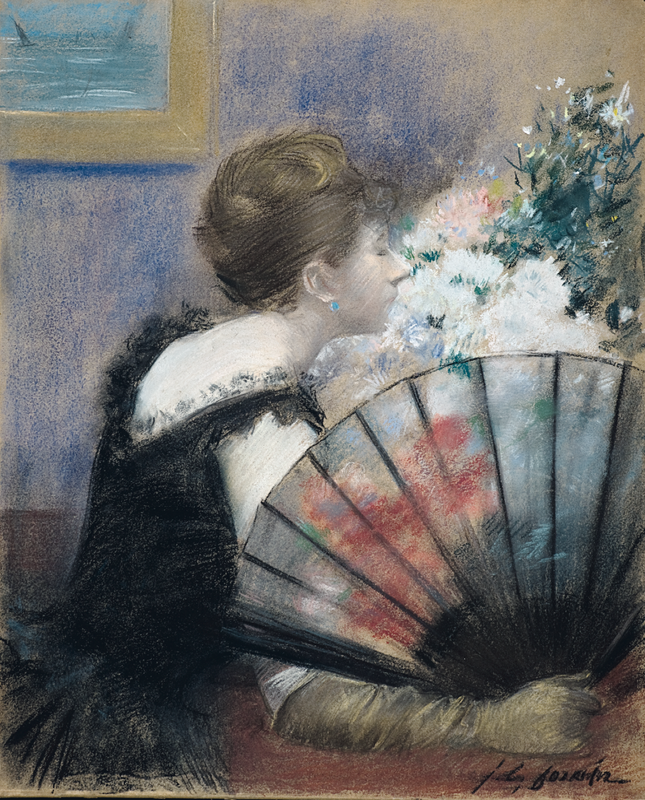 In 1886, the art dealer Paul Durand-Ruel exhibited Forain’s paintings in New York alongside canvases by the likes of Edgar Degas, Édouard Manet, Auguste Renoir, Claude Monet and Camille Pissarro. 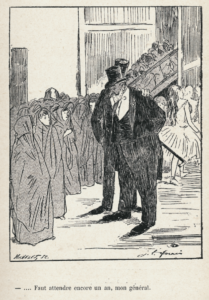 From 1887, Forain’s satirical drawings were regularly published by Le Courrier français. That year was also the beginning of an extraordinary and fruitful collaboration between Forain and Le Figaro, which lasted over 35 years. Utilising his cutting wit, Forain produced caricatures for many newspapers including L’Écho de Paris, The New York Herald, Le Journal Amusant, Le Temps, L’Assiette au beurre, Le Gaulois and Le Rire, which came to define him as Honoré Daumier’s fiercest successor. When Forain was asked where his next exhibition would be, he answered “in the newsstands”. He denounced social injustice and the hypocrisy of the Bourgeoisie. In 1889, he launched his own weekly newspaper, Le Fifre, to “relate to everyday life, showing the ridiculousness of certain grievances, the sadness of so many joys”. With events, such as the Panama scandals, the anarchist crisis and the Dreyfus affair, disrupting his country, the artist began moving away from social satire in order to focus on political cartoons. 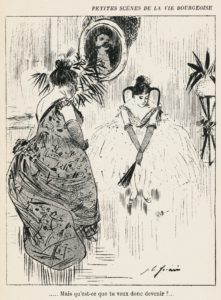 The controversial artist also unleashed his anger in Pstt… !, an anti-Dreyfusard journal launched in 1898 with his cartoonist friend Caran d’Ache and the strong support of Degas. 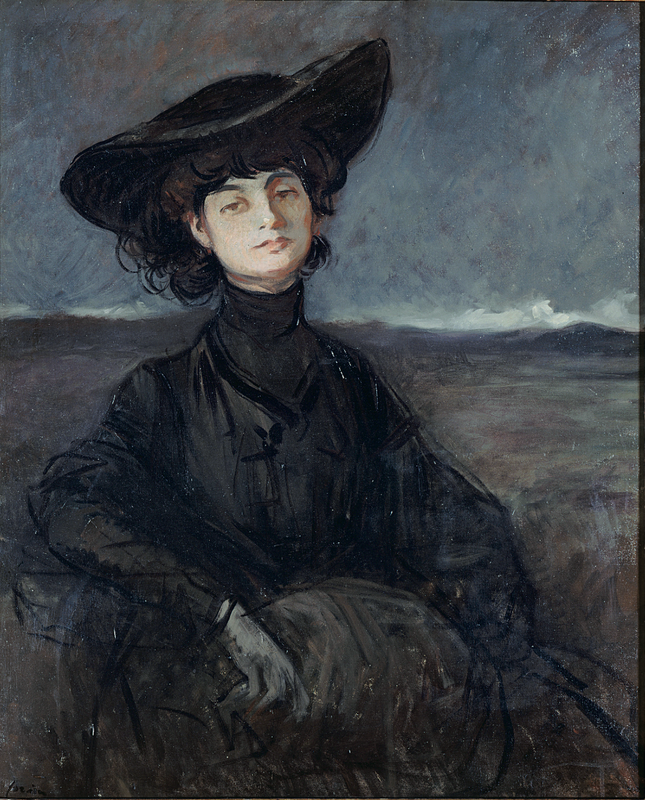 In 1891, Forain married Jeanne Bosc, a beautiful young painter who brought stability to his frantic tendencies. In 1893, they went to New York and Chicago together on the invitation of the director of the New York Herald, Gordon Bennett. 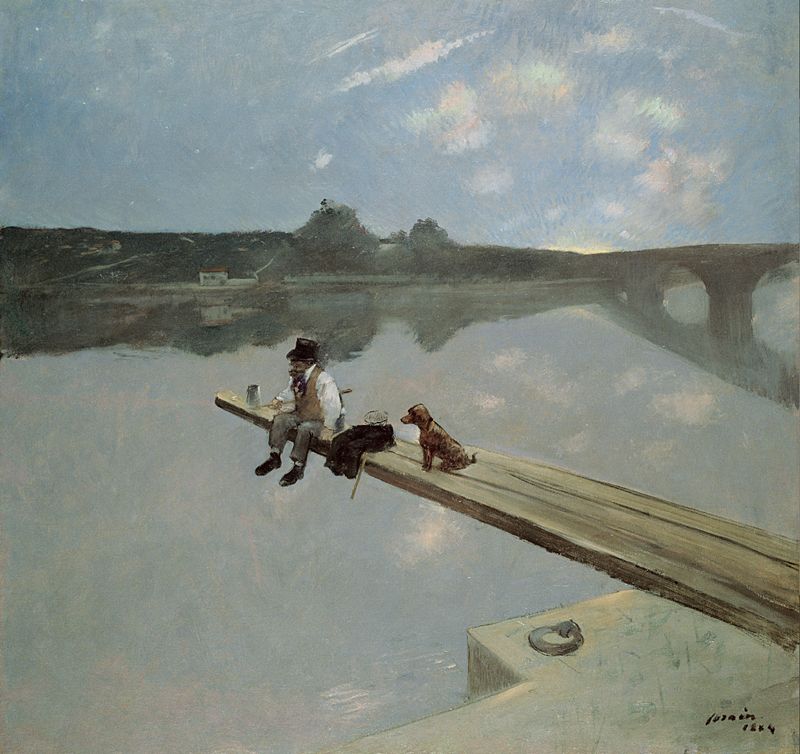 They then travelled frequently: Venice (1893), Madrid (1894), Guernsey (1894) to see Georges Victor Hugo and back to Madrid in 1900 to visit the Goya exhibition. Between 1875 and 1886, the artist produced etchings of mainly natural scenes before turning to lithography. He frequently used this technique to depict nudes washing themselves and scenes of social mores, employing remarkable vigour and spontaneity. After regaining his faith on Christmas day 1900, he aimed to use his art to serve God. 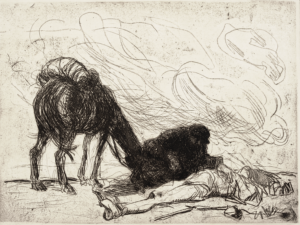 From then on, his etchings and drypoint focused mainly on religious scenes inspired by his several pilgrimages to Lourdes. In addition to this, he painted law courtroom scenes which denounced the failings of the justice system and condemned human injustices. The former enfant terrible of Paris whose witticisms were so sought after grew into a member of select circles such as Le Jockey Club and L’Automobile Club. 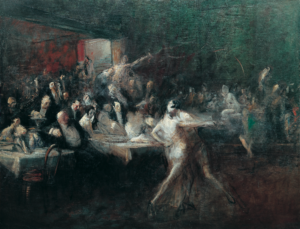 Forain even had his own table at Maxim’s and was present at dinners organised by the art dealer Ambroise Vollard alongside Degas, Cézanne and Renoir. In 1913, the Forain exhibition at the Musée des Arts Décoratifs featured around 400 paintings, watercolours, drawings, lithographs and etchings. 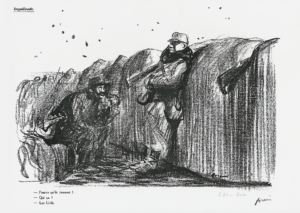 During WWI, Forain put his talent to the service of his country: his drawings strengthened patriotism in the columns of L’Opinion, Le Figaro and Oui. His illustrations evoked shock and were passionately discussed by readers. A cartoon published on the 9th of January 1915, which featured two soldiers questioning the commitment on the home front, gained a legendary status: “As long as they hold! … Who? The Civilians.” That same year, the 63-year-old artist enlisted in the newly created Camouflage Section of the French Army. Wearing his uniform in 1917, he attended the burial of his close friend Degas who, evoking his future funeral, had said one day: “I don’t want a speech. Well! Forain, you will make one, you will say: he loved to draw.” (Je ne veux pas de discours. Si ! Forain vous en ferez un, vous direz : il aimait le dessin). 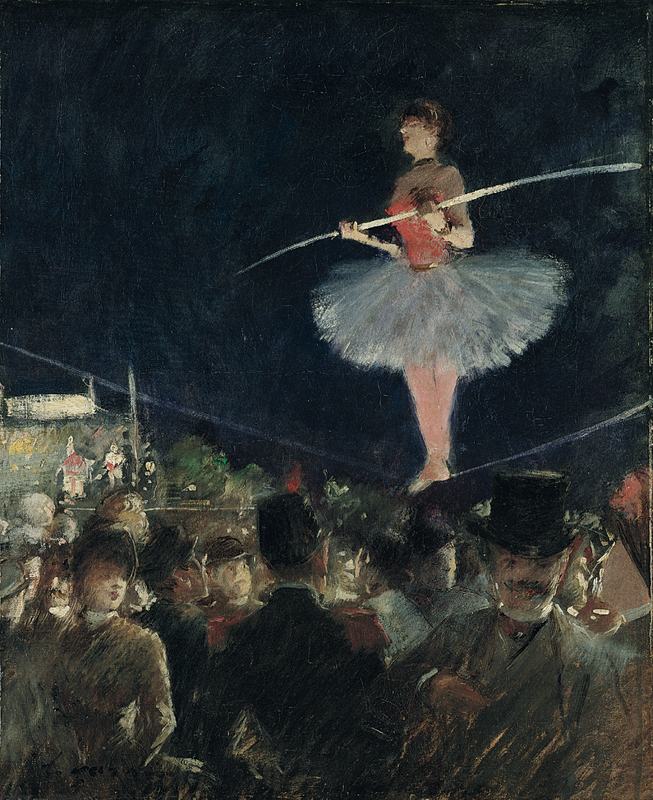 With the war over, Forain continued his collaboration with Le Figaro until 1924, but progressively abandoned his chalks for paint brushes in depicting the frenzied and free atmosphere common to the nightlife of the Roaring Twenties. 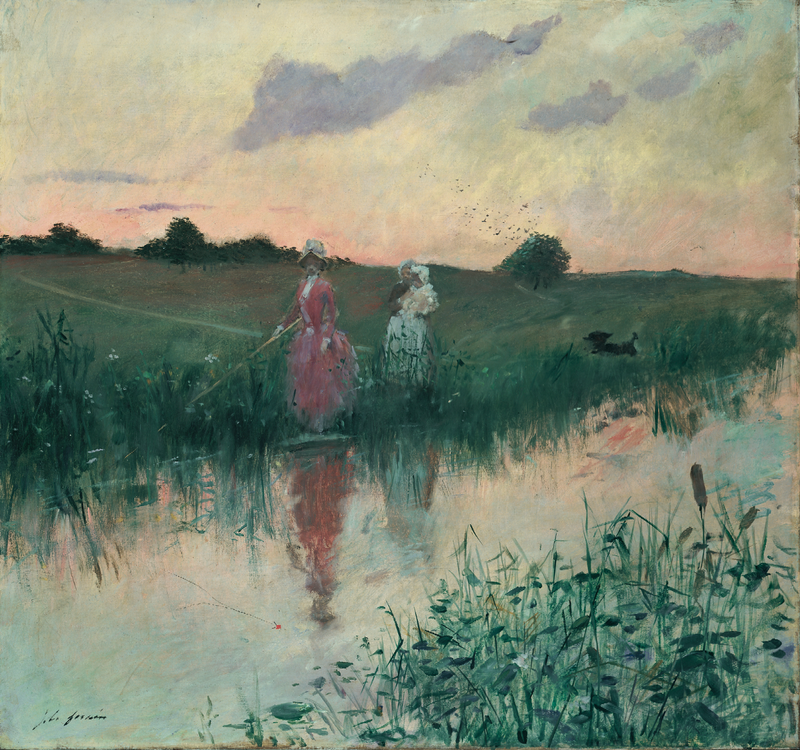 In addition to being elected as President to both the Philanthropic Society of the République de Montmartre and the National Society of Fine Arts, Forain became a member of the Academy of Fine Arts. In 1928, he received the Legion of Honour and was promoted as a foreign member to the Royal Academy of Sweden. Two years later, he became a member of the Royal Academy of England. Forain passed away in his Parisian home on the 11th of July 1931. 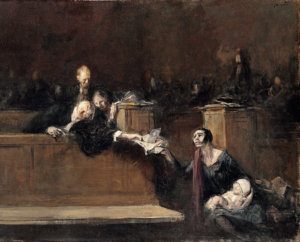 Image footer: Jean-Louis Forain, The Client, 1878, Watercolor, ©Dixon Gallery and Gardens collection.